Cohuna is a rural town in the Torrumbarry irrigation area, 60 km north-west of Echuca. It is situated on the Murray Valley Highway and the Gunbower Creek, a tributary of the Murray River. The first pastoral settlement in the Cohuna area was the Gunbower pastoral run (1845). In 1874 farm selections became available in the area and in 1875 the Cohuna village was proclaimed. It is thought that the name resembles an Aboriginal word for the native companion or brolga. In 1877-81 there were periods of poor rainfall and some farmers undertook private irrigation schemes. Water was pumped from the Kow Swamp, south-east of Cohuna, and another pumping scheme was started west of Cohuna (1882-83). The Cohuna Irrigation Trust (1886) administered an area of 400 square kilometres, and constructed a pumping works at Cohuna. The flat land was ideal for irrigation, and a weir was built on the Murray River in 1908 for gravity-fed irrigation channels. Much of the red gum weir structure lasted for 100 years. Market gardening began in the 1890s, running until the 1920s when rising water tables appear to have stopped it. More successful was dairying: a cooperative butter factory was started in 1906, later becoming part of Murray Goulburn Cooperative Ltd. The Commission's improved irrigation works began in about 1910. An agricultural society was formed in 1911, the town water tower was built in 1912, and a Farmers' Weekly newspaper was started in 1913. Two years later a branch railway line was opened from Elmore to Cohuna and a private hospital – the forerunner of Cohuna District Hospital (1952) – was opened. A memorial hall was built in 1922 and a Catholic school was opened three years later. The population of Cohuna doubled between 1933 and 1981. Whilst some small farm holdings have been consolidated, Cohuna has some tourist attractions with Gunbower Island and the waterways, strengthening the township's economy. The primary school became a higher elementary school (1924) and a district consolidated school in 1948. A high school was opened in 1955. Before the consolidation of rural State primary schools in 1948-49, there were 15 of them in Cohuna Shire, including Gunbower primary school and three others on Gunbower Island. Those continuing after 1949 were Cohuna*, Gunbower Island, Gunbower*, Leitchville*, Mead, Milnes Bridge, Koroop and Gannawarra North. Only those marked with an asterisk continued after 2010. The dates of the closures were: Gunbower Island, 1976; Mead, 1992; Milnes Bridge, 1955; Koroop, 1975; Gannawarra North, 1974. Cohuna has several recreational areas and facilities: a golf course, a showground, a large reserve north of the town with two ovals, bowls and tennis venues and a swimming pool, and pistol and small bore clubs. There is an active historical society which has a museum in the former Presbyterian church. 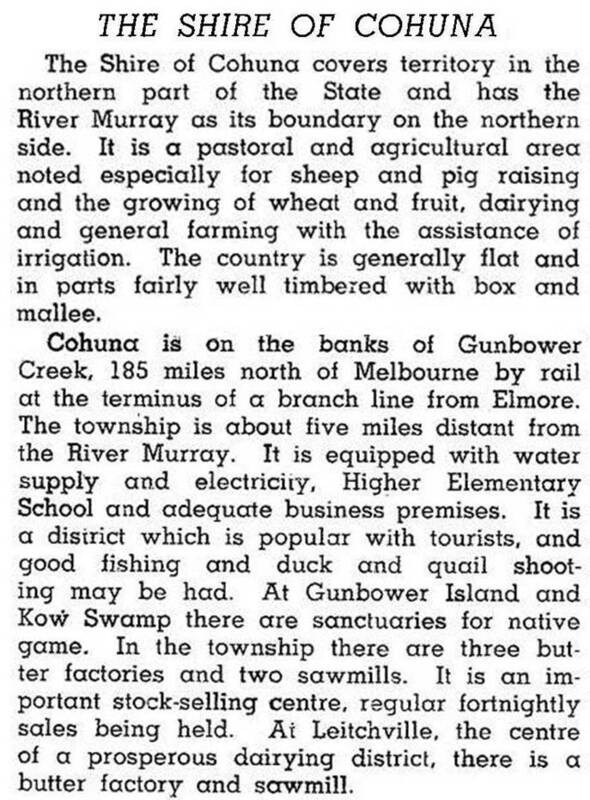 The Gunbower Island area provides fishing and shooting, and timber from the island is cut at the Cohuna sawmill. In 1988 part of the Gunbower Creek was made into Apex Lake. There is a hospital, Catholic and State primary schools, a stock saleyards, a caravan park, a hotel, a hotel/motel, and the weekly newspaper. The railway was closed in 1981. In 2014 the consolidated school had an enrolment of 173 and the secondary college 282. Cohuna has several notable buildings: Scots Church, the masonic temple, the court house, the Catholic church and the higher elementary school. In 1994 farmland took up 88% of the area (494.7 square km) of Cohuna Shire, carrying 10,800 meat cattle, 47,700 dairy cattle, 32,000 pigs and 10,800 sheep. On 20 January 1995, most of Cohuna Shire was united with Kerang borough and most of Kerang Shire to form Gannawarra Shire. The new shire's administrative centre is Cohuna. In 2004 the State Government agreed to consult a council of Yorta Yorta people on management issues of an area of public land between Cohuna, Corowa, in southern New South Wales, and Euroa, including the Barmah State Forest. The town celebrates the annual Big Cohuna Festival. A new housing development along Cohuna Island Road for 35 residential lots was approved in 2009.